Step 1: Cook the pasta. Just follow the package directions. But what I do is just boil water in a pot, add some salt and a little bit of oil so the pasta won’t stick. Or so I read. Step 2: Make Garlic Oil. In a separate pan, heat 2 tablespoons of oil over medium heat. You can actually add breadcrumbs and fry it until golden brown in this step. But I had no breadcrumbs at that time. 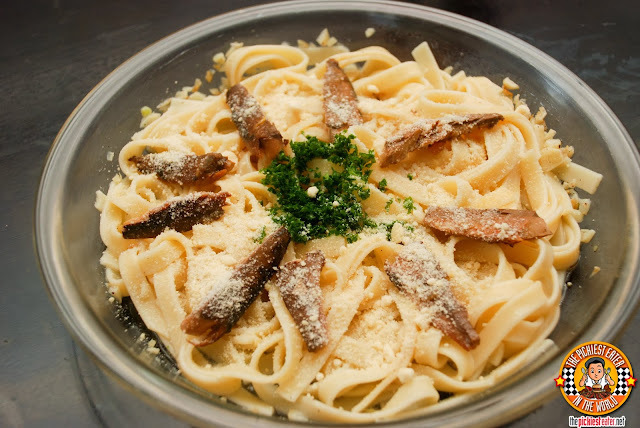 Once the breadcrumbs are golden brown, transfer it all (including the oil) in a bowl or wherever you wish to plate the pasta. Step 3: Mix! Get the lemon juice, pepper, and salt and mix it into the plate of garlic oil and whisk it all. Step 3: Plate. You can actually mix it all together but I wanted to do a little amateur plating. 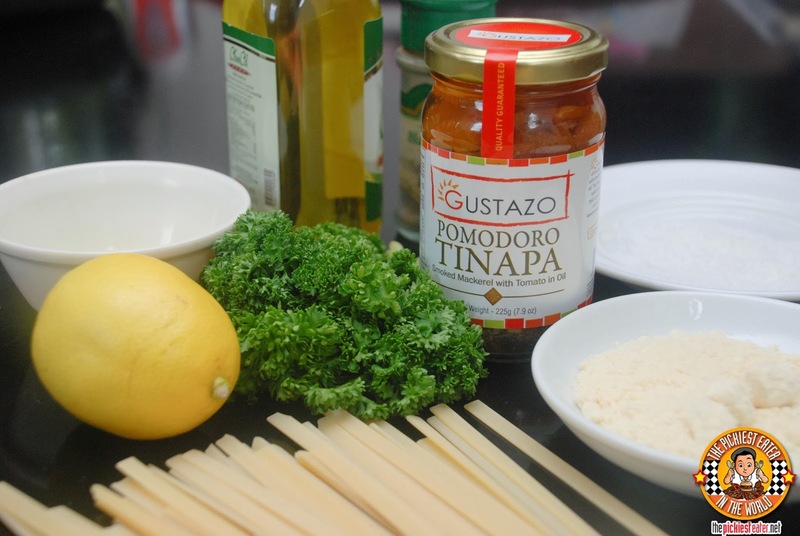 I put pieces of the Gustazo Pomodoro Tinapa on top with parsley in the middle, and then dusted it all off with lots of parmesan cheese! Voila! That’s it! Forgive my amateur plating haha! But here’s my final product! It has a nice balance of acidity and saltiness from the Gustazo Pomodoro Tinapa. And healthy too! This is even easier to make! And I bet you that most of the ingredients can already be found in your kitchen! Step 5: Pop it in the toaster for around 5 minutes or until the cheese bubbles. This simple dish turned out to be really good! 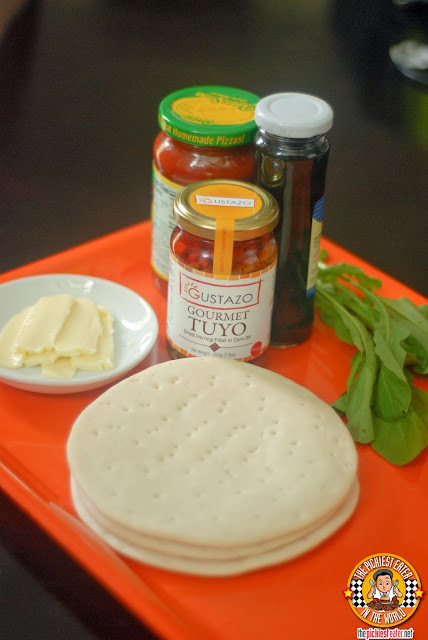 There’s an excellent balance of sweet and a tinge of heat from the Gustazo Gourmet Tuyo. 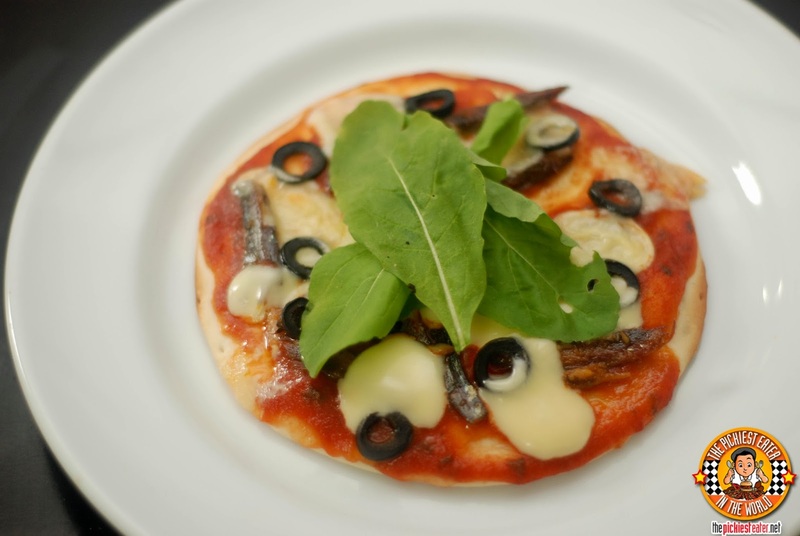 And then the freshness and slight crunch of the arugula leaves make it even more interesting. It’s certainly something you can create in under 10 minutes! 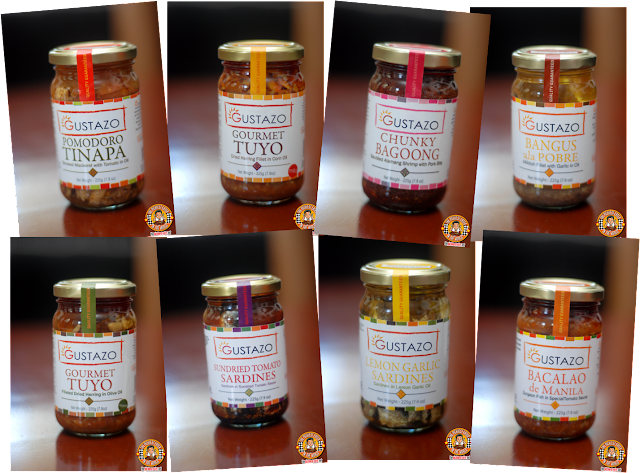 Gustazo Gourmet goodies are definitely going to be part of my grocery list from now on. With these, I can be sure that I am getting products with excellent quality. These jars sell from 120-180 pesos range. And a jar contains 225 grams of these gourmet fish. It’s definitely excellent value for your money! 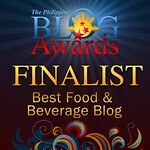 And they stay true to their name as Gustazo actually means “Great Pleasure”. And that’s exactly what you get in every bite! WE'RE HOLDING A GIVEAWAY!!! 5 lucky winners will be able to try the goodness of Gustazo Gourmet by winning a Gustazo Giftpack each! Just follow the rafflecopter below! Ready? GO! Id love to try it and share with my family.Merry Christmas. 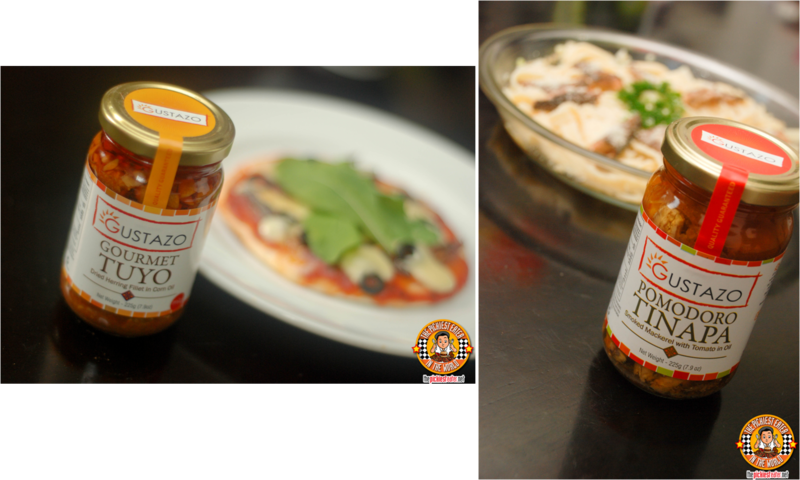 I would love to win because I wanna try different recipe using does Gustazo Gourmet products. It would definitely be exciting and delicious. Can't wait to try it. Q: Why would you like to win? A; Because scoring those jars of gourmet fish would mean a whole lot of experimenting in the kitchen. New recipes and kitchen adventures make me happy. Interesting and easy recipes! I'm excited to cook and eat these dishes! I love gourmet sauces and foods. I love to use them, specially when I am faced with other food that are lacking in taste & zest!